This "powerful and disturbing history" exposes how American governments deliberately imposed racial segregation on metropolitan areas nationwide (New York Times Book Review). 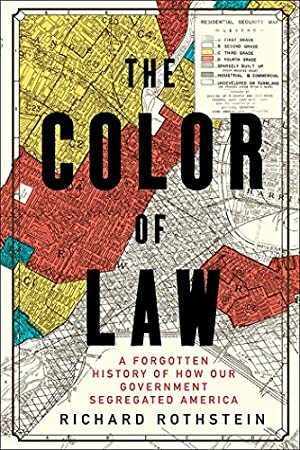 Widely heralded as a "masterful" (Washington Post) and "essential" (Slate) history of the modern American metropolis, Richard Rothstein's The Color of Law offers "the most forceful argument ever published on how federal, state, and local governments gave rise to and reinforced neighborhood segregation" (William Julius Wilson). Exploding the myth of de facto segregation arising from private prejudice or the unintended consequences of economic forces, Rothstein describes how the American government systematically imposed residential segregation: with undisguised racial zoning; public housing that purposefully segregated previously mixed communities; subsidies for builders to create whites-only suburbs; tax exemptions for institutions that enforced segregation; and support for violent resistance to African Americans in white neighborhoods. A groundbreaking, "virtually indispensable" study that has already transformed our understanding of twentieth-century urban history (Chicago Daily Observer), The Color of Law forces us to face the obligation to remedy our unconstitutional past. Track It. This book has been $7.87 within the past year. Log In to track Richard Rothstein on eReaderIQ. to be notified each time the price drops on any book by Richard Rothstein. to stop tracking Richard Rothstein. We started tracking this book on May 4, 2017. This book was $14.16 when we started tracking it. The price of this book has changed 76 times in the past 719 days. The current price of this book is $10.99 last checked 22 hours ago. This lowest price this book has been offered at in the past 90 days is $10.18. This lowest price this book has been offered at in the past year is $7.87. The lowest price to date was $7.87 last reached on November 27, 2018. This book has been $7.87 one time since we started tracking it. The highest price to date was $14.99 last reached on November 3, 2017. This book has been $14.99 one time since we started tracking it. We last verified the price of this book about 22 hours ago. At that time, the price was $10.99. This price is subject to change. The price displayed on the Amazon.com website at the time of purchase is the price you will pay for this book. Please confirm the price before making any purchases.